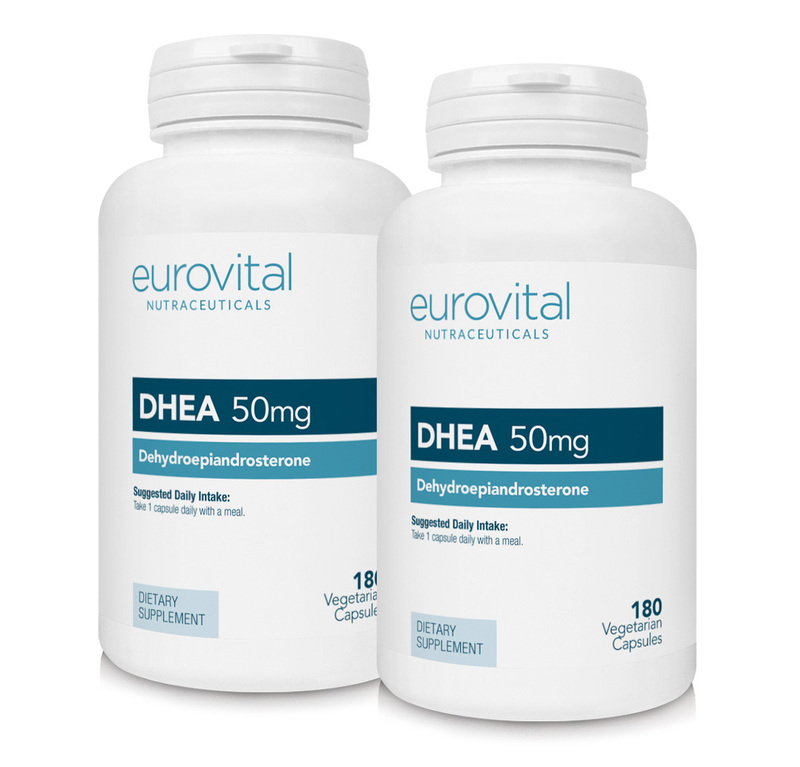 DHEA is a hormone produced by the adrenal gland. When we are young, around 7 years of age, we begin producing this hormone naturally. Blood levels reach their highest during our late teens and begin to decline around age 25. DHEA levels decline at the rate of about 20% per decade until we eventually bottom out at approximately 10% of peak levels by the time we reach 80 years of age. DHEA’s most overlooked but vital role may be its relationship with cortisol. DHEA has an inverse relationship to cortisol, i.e. when DHEA is low cortisol levels are elevated and vice-versa. Maintaining healthy DHEA levels while keeping coritisol levels under control may help support healthy aging. Other ingredients: Rice flour, hydroxypropyl methylcellulose, vegetable magnesium stearate. As a nutritional supplement for adults, take one (1) OR two (2) capsules daily with a meal or as recommended by your health care professional. Warning: If you are under medical supervision, using any tranquilizers, sedatives, pregnant or lactating, consult a health care professional before using this product. Not intended for individuals with autoimmune conditions or depressive disorders. KEEP OUT OF REACH OF CHILDREN. Store in a cool, dry place. Do not use this product if the safety seal on the bottle is broken. Not for use by children under 12 years of age. Do not take while operating machinery or driving a vehicle. I feel much younger than my 70+ years. I have this to supplement my hydrocortisone replacement prescribed by my specialist and it is recommended for people who are on long term steroids as prescribed steroids do not provide all that your body would normally produce and once I started taking this I felt the benefits of more energy and generally feeling more normal. I have used DHEA for a few years now and find it helps me greatly. I am a 62 yr old man with Crohns disease and arthritis. Despite this I still manage to continue with my work, some aspects of which are physically quite demanding. I believe that the DHEA helps me to maintain my muscle mass, hormone levels and stamina. I certainly miss it if I stop taking it for a while. Biovea's Value packs help me financially too. Great product and good price! This value pack offered a terrific savings off the normal price for DHEA!! !Thank you, BIOVEA!!!! This wonderful capsule gives me more energy and helps me feel balanced and less perimenapausal. It also really helps my arthritis. Thankfully I am now pain free! Double pack better value if taking long term. Product as described and personally find easier to take than the tablets which can be rather chalky. Excellent product. I have been using it for many years and I have found it to be very effective.